Y’all left some amazingly helpful comments on my last post about organizing a garage workshop, and for the last two days, each time I’ve taken a break, I’ve been reading over those comments (some several times), clicking on more links, and looking up the names and ideas you told me about. And of course, those names and ideas have lead to even more links and more amazing ideas. I never knew there were so many ideas out there for organizing garage workshops!! 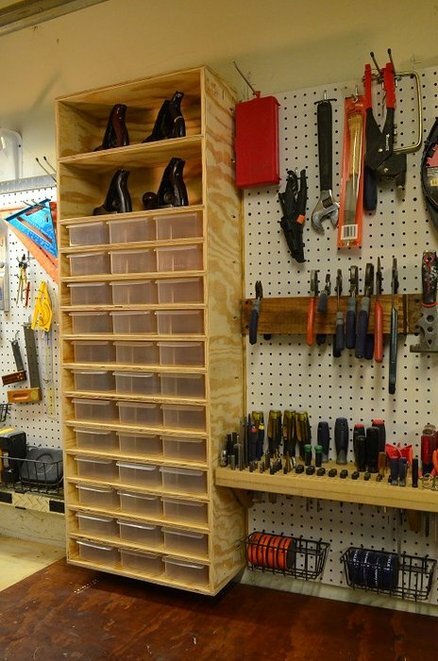 I don’t have everything figured out yet (I have plenty of time to design my workshop before I’ll actually be ready to get started*), but a general design is starting to formulate in my head, and I’ve come across a few garage workshop “must have” items that I’m almost 100% sure will eventually be in my garage workshop. I really love her shallow drawers, also. 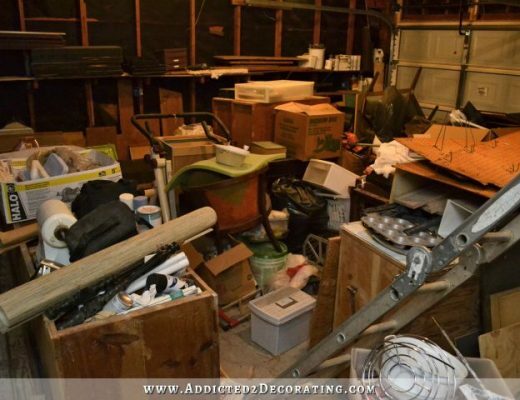 But so many of you made a good case for using storage items that were more portable so that the actual storage container (rather than a bunch of individual tools) can be taken out, carried into the house, and then brought back and put away. That idea sounds really great to me, and I came across this storage unit that might be just perfect for that. I like that the containers are clear, so you can see at a glance what’s in there. Of course, I would label all of them as well. I just love how tidy that looks! I was already planning on lots of pegboard storage, but then I came across this ingenious design that really maximizes pegboard space with sliding doors. 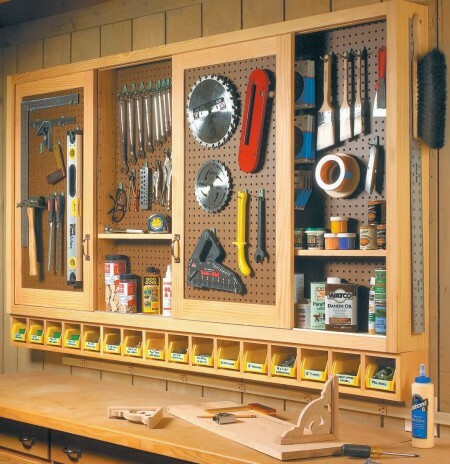 I also like the storage along the bottom for those small items like screws, nails, washers, etc. 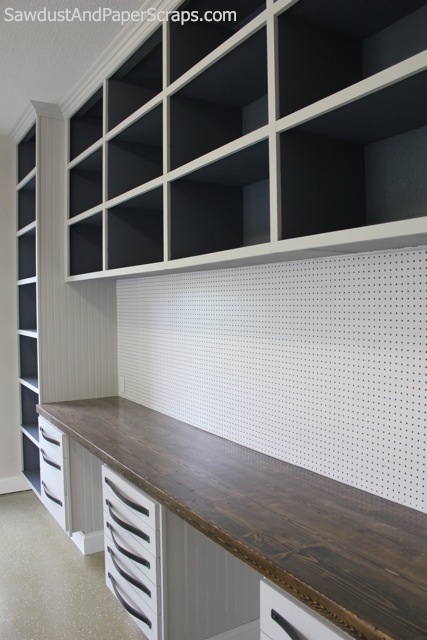 I also really like this pegboard storage design with the hinged doors. It would keep most of the dust out, which is great, but I can also see myself just leaving the doors open all the time because of the hassle of opening and closing them. So I’m not sure that this would work for me. 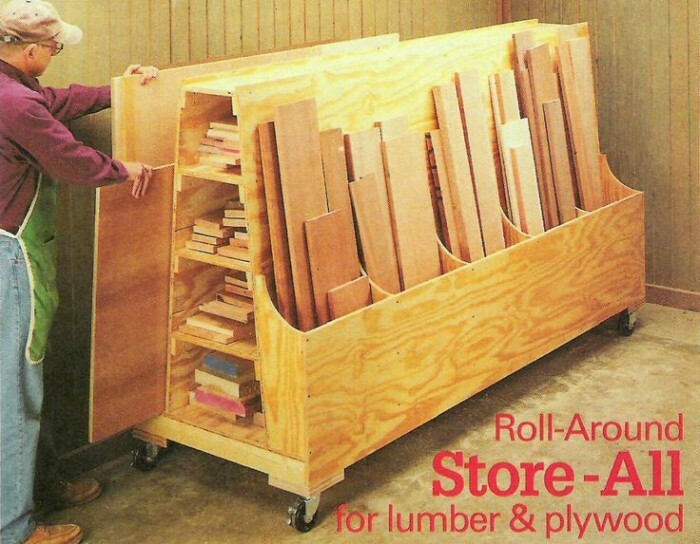 After looking at several different designs for lumber and plywood storage, I think this rolling cart is my favorite design. I like that it has storage for large sheet goods, as well as lumber, and smaller pieces of scrap plywood and MDF. I came across this YouTube video that shows how to build something almost identical to that rolling cart. The thing I’m probably THE most excited about is building this miter saw workbench. I originally saw this one from a link that someone left in a comment, but I think the built-in design would limit the length of items you can cut, and sometimes stuff like crown moulding can be really long. But this rolling mobile design solves that problem! 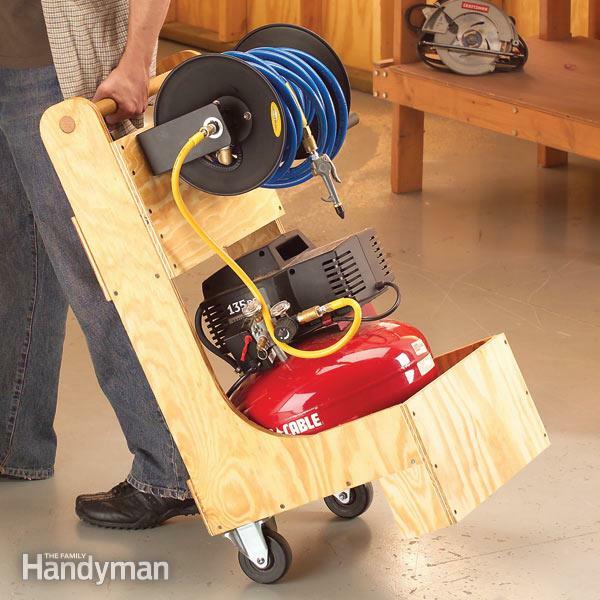 And this air compressor cart is an absolute must-have. In fact, since my air compressor is one of my most-used tools, and I’m constantly having to lug it around from room to room, I will probably make this one sooner than later. I’d like to modify the design so that it has storage for my nail guns and staple gun. And finally, someone just this morning sent me a link to this garage makeover to remind me that garage workshops don’t have to be boring! 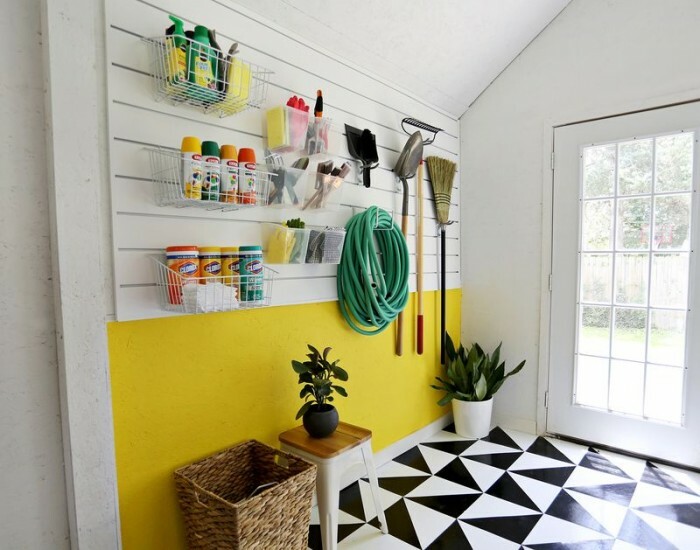 🙂 And since I’ll be spending a great deal of time in my workshop, and I love color, I can assure you that I’ll be adding some color and pattern in my garage somehow. So those are the storage and design ideas that have made it onto my “must have” list so far. I know that as I continue to plan my workshop, I’ll be adding other ideas to the list as well. It’s hard to believe that I’ve been DIYing for as long as I have (over 20 years), and I’ve never had a workshop of my own! I’m having so much fun dreaming about and planning this. Oh, and one last thing I came across that isn’t really about design or storage, but have y’all seen this Foreman pocket hole tool from Kreg? *To be clear, this garage workshop project is a future project. 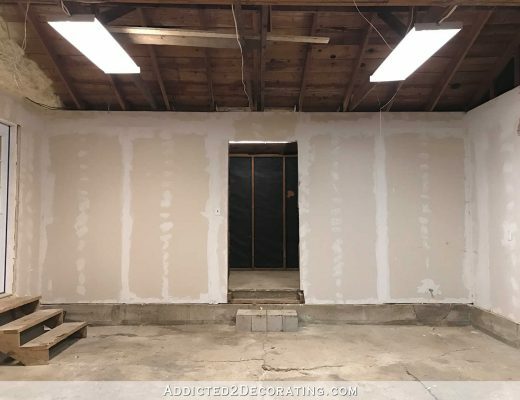 When I said that I will be using the old kitchen cabinets in my garage temporarily, I meant that I will actually be using the cabinets I have now, but I just won’t be keeping them as part of my permanent workshop design as I had originally planned. One day…in the future…I want to upgrade and completely organize and build custom workshop. What I did not say or mean was that I was going to completely drop everything else (entryway, dining room, and music room) and start building a custom workshop immediately. The only reason I’m even thinking about, and working on, my garage right now is because my father-in-law is here. And as I’ve said many times before, when he comes, I drop whatever I’m doing and I focus on projects that need to be done, and that I can’t do on my own. 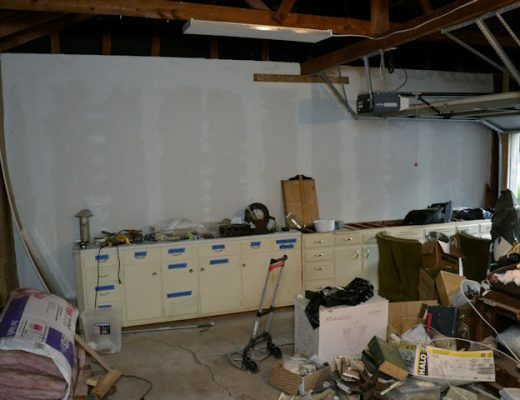 That project, right now, is purging, organizing, insulating and drywalling my garage to make it an actual usable space rather than a storage room packed full of stuff I can’t even get to. Now that that’s almost done, I can move all of the tools and building products out of my house, get some organization in my house, and actually have room to work on my entryway, dining room, and music room. That makes sense, right? But in the meantime, I do have fun dreaming and planning my future garage workshop. What fun – all ideas look good. Yikes! I’m your first reader today? 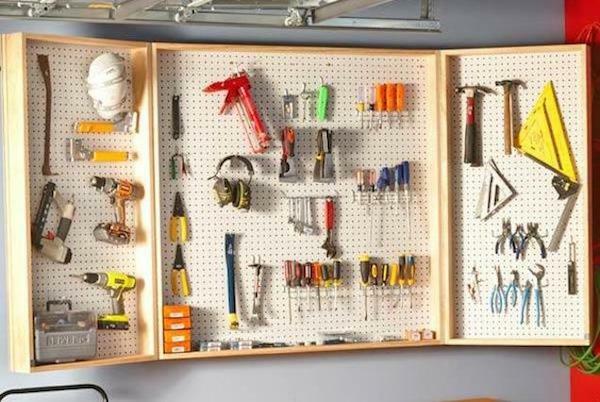 Love all these ideas, especially the sliding pegboard and rolling wood storage. Great ideas and Ican’t wait to see what sunny colors you choose. Me too. LOL. I still have to get my ex to get a pile of his stuff out of my basement. Hi Kristi, just a quick thougt, other that I love the air compressor cart, you might want to think about your HVAC before you start putting up any more permanent walls and ceilings. They will have to run duct work and put vents etc in the walls and ceilings. Rather than have someone come in and mess up your work, you might want to get someone in asap to look the job over and tell you what you should finish and what you should leave alone. I know you said you settle at the end of the month on the condo, so once that is done you could get the hvac done by October. Blessings. One thing I did in our workshop area, is covered the long counter top with this rubber matting stuff that I got at lowes. It is sold by the running foot, is pretty thin and has little grooves in it. It is very inexpensive and and easy to work with. And easy to clean.It makes an excellent work surface and saves your counter tops too. Wow, you aren’t kidding when you say you check all comments! I’m impressed! 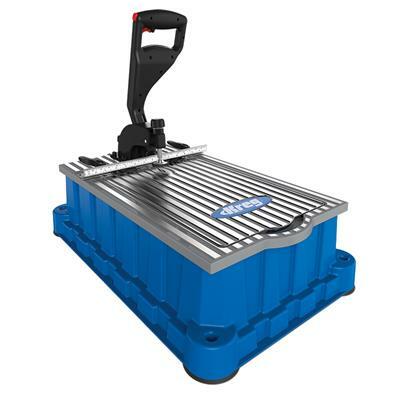 I don’t remember when it was, but the issue of the tools all over the house came up before and there was quite a few comments with DIY portable tool boxes?carriers? not sure what to call them but they were similar to the air compressor cart. Maybe you have those stored somewhere? What I do remember is that getting rid of the mess of tools in your house was one of your goals for this year – and I believe this is now becoming a reality. I hope this ends up making your life more comfortable – I managed to get some things out of the way this summer and I felt a huge weight lifted off me that I didn’t even know existed! What’s next on the father-in-law list? He’s still going to do some insulating and drywalling in the storage room at the back of the garage. Then we might move on to the drywall on the ceiling of the breakfast room. I’m SO anxious to get that done. I want that ugly paneling off of the ceiling, and I want the drywall raised to the normal ceiling height. I can’t wait to get that done, so I’m really hoping that he can get the rest of the garage finished and still have time for the breakfast room. In the meantime, I’ve been doing some work in the dining room and entryway. Good luck then, hope he has the time to do it, and that you find the best possible situation under the ugly paneling! You’re going to get so much more done once you finish this workshop! For someone as active as you are this is going to be so beneficial to you. What great ideas you’ve shared! Of course you have ideas and plans spinning around long before you’re ready, and regarding many different projects….doesn’t everyone?! Ha! The planning for me might just be more than half the fun, and I think that it enables you to clarify what you really want and need when you have a while to think about it. Another suggestion that I would have, is to consider building a panel saw, since you do so much cabinetry/furniture construction. I built this one: https://www.pinterest.com/pin/67694800626061671/ I’ve seen others that are attached to the walls and such. The wings are removable, and the saw part is a circular saw that you mount to a plate that you can either cut up and down, or push stuff through. I’m an artist and build my own cradled panels, as well as build furniture, so I use mine all the time. The biggest recommendation I have, though, is to put everything that you can on casters so you can configure your space however you need to for the project at hand. I really like that lumber and plywood storage much better! It seems way more practical and uses up more vertical space, which is a great space saver. Also, OH MY GOSH, it had never, ever dawned on me that I could BUILD one of those panel saws myself!!! Every time I’m at Home Depot getting plywood or MDF cut, I dream of having one of those saws at my house. I never actually thought that was something that was within reach, though. I imagined that they’d cost $10,000 or so. It never occurred to me to build one using a circular saw. AMAZING!! That has to be my favorite idea ever!! Thank you! I’m so glad you found my ideas helpful!!! Thanks for your hard work in finding a picture of the bin storage unit. I will absolutely be doing that in my basement. I am a huge fan of storage containers now. For the first time my paint cabinet is organized with labeled bins. Even if I don’t have a grab and go container, I can fill up an empty container with my project needs. It is so much faster and my “stuff” stays so dust free that I am a huge fan of the bin organization system. Great ideas and I understand a workshop being a work in progress. Mine is too! Thanks for all of your great ideas and the ideas in the comments. Are you planning on parking in the garage as well? I am hoping to keep one side clear enough so that I can fit my car in there. That’s why I want everything that’s not on the far, long wall to be on casters so that I can easily move them when not in use. This was a great post, really makes me want to get into the garage and clean it up! But I did want to warn you about the compressor cart. My hubby actually built this exact one and was so excited to use it. .however with the crank wheel (which, by the way, is costly and very heavy on its own) it was too bulky and heavy to move around. If it was going to stay in the garage, I could see that.. but to go from garage to house took 2 of us to move. So after a couple of years we dismantled it and got a larger compressor on wheels from Harbor Freight. We are still trying to sell the crank on Craigslist! 🙂 be forewarned. ..getting it up and down steps almost cost me a finger! I’ll definitely keep that in mind! Mine will have to go up and down the steps in the garage, and I’ll need to be able to do that on my own. Alice made two great points before I could get there… My husband does his woodworking/cabinetry usiness out of our garage and two things he’s found invaluable are casters on everything, except the lumber storage, which is mostly vertical (as yours photo shows) but non-moving (too dang heavy!). I have been dreaming of that Kreg tool for about 2 months. No matter what I say, hub says no! And since I just ordered a last minute laptop for school, no means NO! Help me with something – I totally get that your stuff needs to be organized for the here and now but – after this house is finished – what are you going to use all this stuff for? Do you plan to start a remodeling biz? 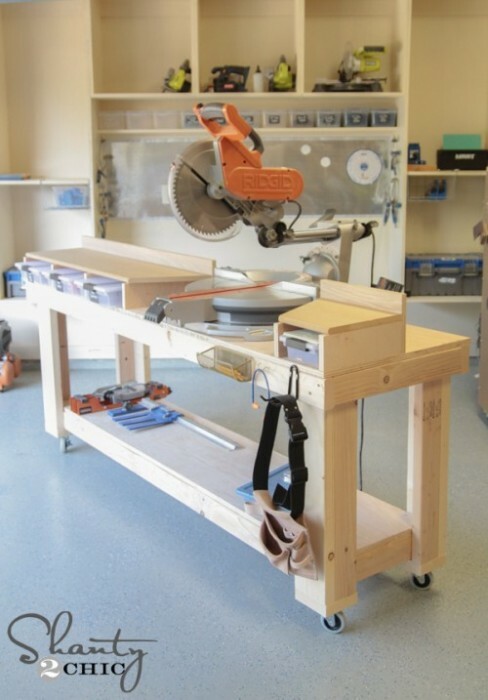 Is there a future need for a miter saw table and a cart for wood pieces? I mean besides the fun of dreaming about it and building it. I’ll always be making stuff. Once my house is finished, I don’t know if I’ll make a business out of it, but that’s possible, I suppose. But I’ve been building and making stuff for 20 years now, even without having a fixer upper that needs help. The fixer upper will keep me busy for a few years, but I’ll keep building long after it’s finished. I wish I lived in Texas so you could do our house! I love your ideas and links. I had never seen the air compressor cart. That will be very helpful. And how did I miss the Kreg Foreman? Definitely on my wish list now. Hi kristi . I like your workshop . You arranged your items very good . All ideas are good. now i am going to clean my garage.